As part of a continuing project under the Southern Ontario Water Consortium (SOWC) Advancing Water Technologies program, the Township of Southgate agreed to a full-scale pilot demonstration using Bishop BioCord Reactors. The purpose of the pilot is to confirm that the technology can be retrofitted into wastewater lagoon systems to aid in year-round nitrification. Bishop Water began a data collection regimen in January of 2016 and installed ten of the BioCord Reactors in the fall of 2016. The BioCord Reactors were assembled and tested by Bishop Water before they were shipped to the Dundalk WWTP. Once they arrived onsite, the BioCord Reactors were initially installed in less than 12 hours near the outlet of cell four. 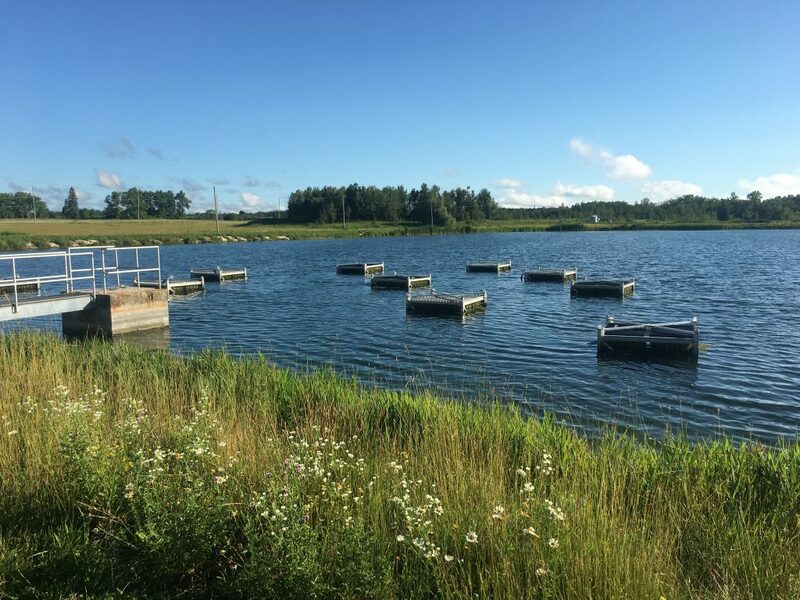 Since the outset of the project, Bishop Water has been collecting weekly samples from the sewage lagoon system to better understand characteristics of each cell to gauge the effects of the BioCord Reactor system. Analysis of the data has been undertaken by academics at Western University with funding from the SOWC’s Advancing Water Technologies Program. Windsor University was also involved in collecting biofilm samples and analyzing the bacterial colonies. After monitoring the system for a year, Bishop Water technicians selected a new location for the BioCord Reactors to optimize their performance based on the water chemistry and biological data that was found during the first winter of operation in cell 4. 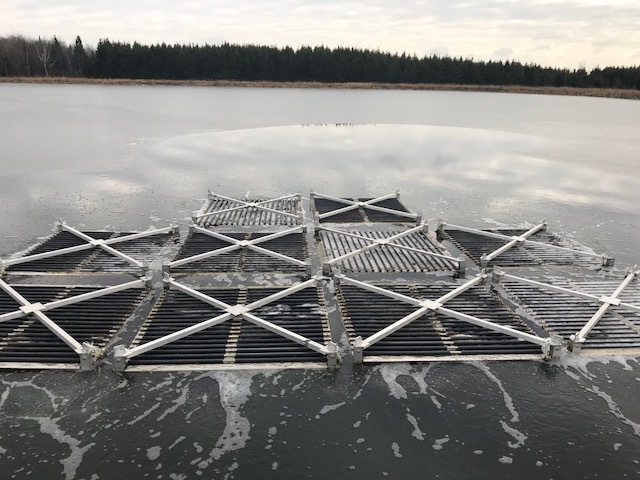 The BioCord reactors were moved from cell four to cell two in late summer of 2017 where there is a higher concentration of ammonia due to less residence time in the four lagoon treatment system. The hypothesis is that this would enable more prolific bacteria growth in the summer to potentially create a healthier colony of bacteria for ammonia removal in the winter. A bubble curtain was also added to ensure that the water does not freeze and cause damage to the system. The process of moving the Reactors to cell 2 took less than one day, and involved using a crane to lift the Reactors out of cell 4, sitting them on a flat-bed, and unloading them into cell 2. The sea container housing all electrical components was also moved in the same day, with minor additional wiring needed. Bishop Water is continuing to monitor the pilot study for Dundalk lagoon system to ensure that it is capable of reducing ammonia levels throughout the year. Stay tuned for more updates about this project in our e-newsletter! Learn more about using BioCord Reactors for ammonia removal. Contact us to discuss solutions for your treatment lagoon. Watch our video to learn more about this project.